I am privileged to introduce you to today’s guest blogger, Alicia. Yes, she is as warm and sweet as her blog, Mayfly. Alicia has a special eye for photography. Her photos make you stop, pause and really notice. I always feel that Alicia has found the trick to getting every drop of enjoyment out of each day! I hope you will stop by and see her beautiful murals, darling dolls and tons of creativeness! 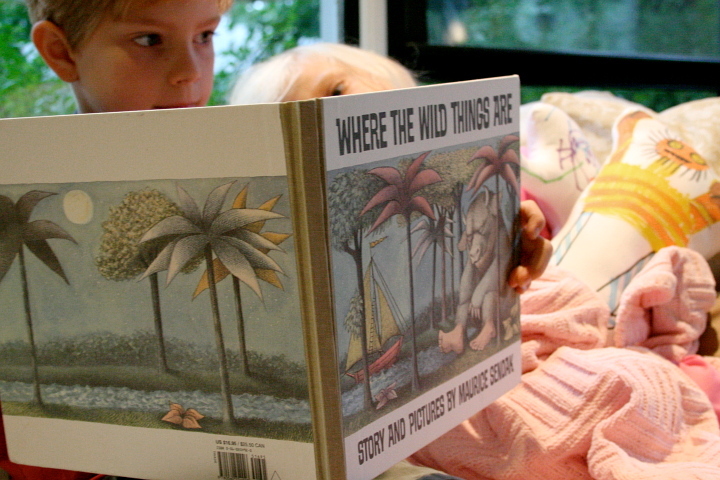 When my son was born, my husband’s very cool cousin Chuck sent a very cool gift: Where the Wild Things Are, written and illustrated by Maurice Sendak. It’s one of those books that you loved yourself as a child and thought you had outgrown, but now that you look again you realize you haven’t. It is full of spirit and imagination and beautiful artwork. I’m betting you all know this book as well as we do. Draw your creature. 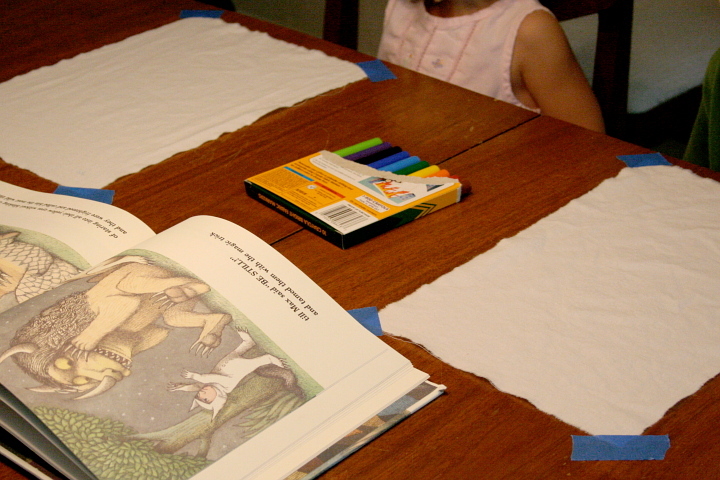 We used used fabric markers (fabric crayons or fabric paint would work too), so I cut each kid two pieces of white cotton from a thrifted cotton sheet- one for the front and one for the backing. Tape down the edges so the fabric stays tight. I told them that they could use the whole piece of fabric, but that they needed to leave some little space all the way around for the stitching. Then they drew their guys. J wanted to use the book for inspiration, N wanted to create her Wild Guy from scratch. Next follow the directions on the markers to heat set the ink. Now cut around the guys with about a 1” border for stitching. (We didn’t decorate the guy’s backside, but you surely could. Just be sure to do it before you stitch, so the markers don’t bleed through to the front.) Turn the drawing right side down against the backing fabric, pin and stitch around the critter leaving a space for turning and stuffing. I used my machine, but you could easily sew these by hand. An older child could even do this step him/herself. Trim to about 1/4” from your seam. Next turn the Wild Guy right side out and stuff him full. My kids loved this step. We used polyfill so they will be washable. Hand stitch the opening closed and you’re ready for business! You could do this with any book really, making existing characters or adding new ones for reenactments, inventing sequels, or just for snuggling. Oh, and one more thing. There is nothing sweeter in the world than seeing your older child reading to the younger one. Nothing. If you haven’t experienced this yet with your kids, just wait. You’ll melt into a puddle- you’ll see. awareness for the Read to Feed program– such an incredibly worthwhile cause. That is really cool! Thanks for the great post! I love this idea so much. My little guy, Mr.P, is not old enough to enjoy such a project yet but I will be sure to do it when he is older. I love your wild thing creations! They are just precious. Encouraging reading and art is the most essential part of a child's education--in my mind! Brilliant and beautiful. I want to do this with my students! I've just come over from Crafty Crow - what an amazing idea. This is a favourite book of both myself and my children and I know they will be desperate to do this once I've shown them your own lovely toys! I LOVE this idea! What a great way to make a story come alive! I love this project!! I really love children's books, and that is one of my favorites. I'm going to school to be a teacher, and that project is definitely going in my future lesson plans. ah this is a fave book in our home as well. i am new to your blog. You have some WONDERFUL CREATIVE ideas that I can not wait to try out. Look forward to reading your future posts. Thanks for the great idea. I am always looking for some new ideas for crafts. Plus, I totally agree with you on the siblings reading to younger siblings. I love when my oldest son (3rd grade) reads to my youngest son (3years old). It brings tears to my eyes. I loved that book as a child! My kids loved it, too! oh i like both the monsters! didnt see the other skinny one, too cute! we make critters like this too, but i like the book idea, putting the two together. that stripey monster guy is soooo cute, i want one! Oh -I love this idea! And so easy too. Very sweet. I can't wait to try it! I love the way Alicia's mind works. Great project! i found your blog via mayfly and love the name. my name is actually cindy lu. love your blog! This is a fabulous project! I love this book. A few years ago I saw a Wild Things play where the kids danced to reggae music in footy-pj monster costumes. I laughed till I cried. What an amazing night. This story is just SO inspiring! I'll be linking to this project today as well. So super cute and I can tell you this bit of creativity from Alicia and her children is an everyday wonderful occurrence.